When I showed you HARE Polish Supernova Springs I told you I also got 2 CrowsToes polishes right? Today I am showing the first of them :). 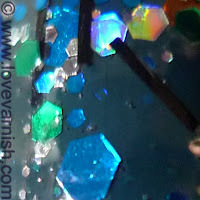 I saw the swatch of CrowsToes Absolum first time ever on Stef's blog Steffels, and I immediatly fell in love. 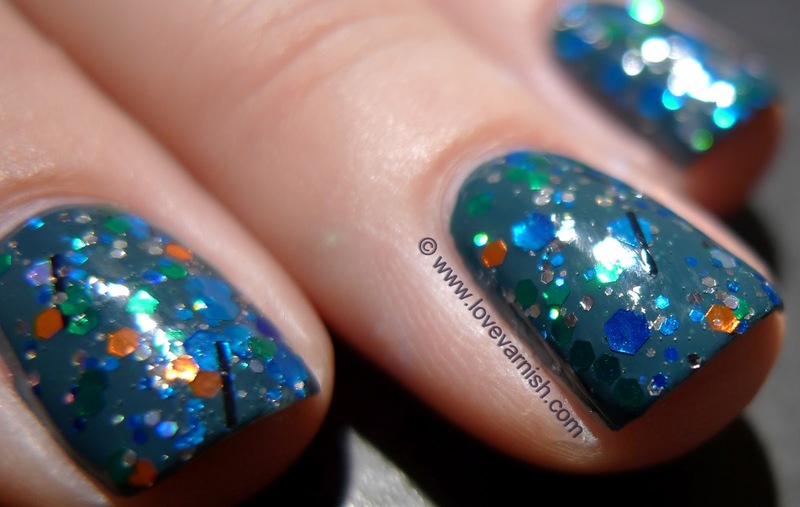 The glitter combo, the basecolor she used for it and just everything about this polish made me fall in love with it. When I got the chance to grab them from Llarowe I was so excited! I recereated the manicure she did with, meaning I used 1 coat of CND Urban Oasis as my base and topped it with 1 coat of CrowsToes Absolum. Now, there is a lot going on in Absolum. Bar glitter, hex glitter, small and big glitter.. but it applies quite easy for such a polish. I made sure after each nail no glitter was sticking out and first topped it with one coat of simple clear polish (no quick drying stuff). After that I topped it off with my regular Essence Better Than Gel Top Sealer and a smooth finish was achieved! I am not pleased with how the pictures turned out so chances are I will be re-wearing and photographing this one! Oh my gosh, I have wanted this ever since I first saw it, I think on Llarowe maybe? I have never been able to get my hands on it though! It looks great with the base you used! And that is perfect on you. Perfect. Such a fun mix of glitter!! I love it! I do too! Just received some more HARE Polish <3. Thanks Kelly, Stef was my inspiration for this <3. I hope you ever get it! Awwww thank you SO MUCH! You know every time I see a comment from you I get so happy (that is how much I adore your blog and nails). I do too! It is pretty awesome!